When you have children, your number one priority in life shifts to keeping them safe. You do everything in your power to offer your children protection, but you can’t always account for the negligence or carelessness of others. Children can get hurt due to the actions of others, and burn injuries can be devastating to both the child and his or her parents. The pain, trauma, and potential for permanent scarring or disfigurement can drastically reshape lives. The World Health Organization (WHO) reports that burns are the fifth most frequent cause of injuries to children, and ranked number eleven in the top causes of fatal injuries to children between the ages of 1 to 9. Center for Disease Control (CDC) data shows that in the United States, children ages 0 to 9 suffered over 78,100 non-fatal burn injuries in 2014. The vast majority of those burns were unintentional, while a small fraction were related to violence. Contact injuries are some of the most common childhood burns. Children are naturally curious about their environment and may reach for objects or appliances, not realizing the danger of heat. 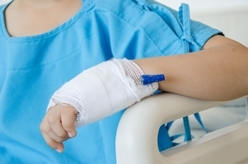 Electrical burns are another concern for children. Faulty cords, plugged-in appliances that fall into a pool or bath water, defective products, or a child inserting an object into an outlet can all cause serious injuries. Children are also more susceptible to solar radiation than adults. A child without sunblock or clothing that protects against the sun’s rays can quickly receive severe burns. First-degree burns are the least severe and involve only a superficial reddening of the skin surface. A mild sunburn is an example of a first-degree burn. Second-degree burns have burned through the top layer of skin, causing severe pain, redness, and blistering. A severe sunburn or contact with scalding hot water are examples of second-degree burns. Third-degree burns are very dangerous. They cause little to no pain, as they are deep enough to destroy the top and middle layers of skin, underlying tissue, and nerves. The area may be darkened or charred, waxy, or white. Third-degree burns are a serious medical emergency and need treatment immediately. Fourth-degree burns are rare, but deadly serious. These kinds of burns penetrate muscle or bone tissue, and require emergency care fast. Treatment can involve extensive surgeries, skin grafts, and more. Prolonged contact with open flame or searing-hot surfaces can cause these types of burns. When an adult agrees to care for a child, assume a “duty of care.” This duty requires that the adult takes legal responsibility for the care of your child. Hired babysitters, daycare employees, teachers, and even friends, neighbors, or family members who watch your child agree to accept this responsibility. Anyone with a duty of care can be held legally liable if he or she fails to take reasonable precautions to ensure the safety of your child. Product manufacturers also have a kind of “duty of care.” When a company produces a toy or other product intended for children, that company must ensure that the design and function of the product pose no unreasonable risks of injury to a child. It’s especially important that companies that fail in their duty to children are held accountable for their faulty products, to prevent further injuries from happening. If your child has been burned and you believe that someone was negligent or failed in his or her duty to care for your child, you may be able to pursue legal compensation for medical bills, rehabilitation costs, loss of function, and more. The Law Office of Kenneth E. Berger would like to help you and your child on the path to recovery. For a free consultation about your case, please call us at 803-790-2800.